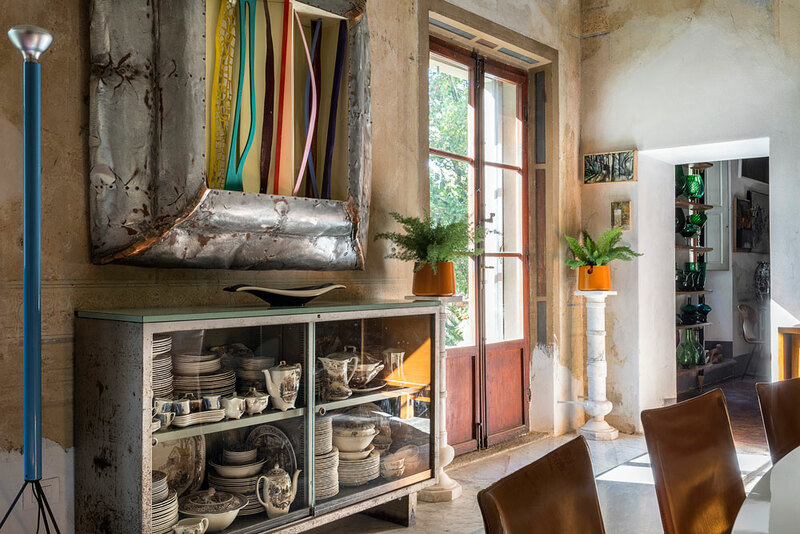 Take a tour of Villa Gaeta, an exquisite 18th-century building in the heart of Tuscany and home of designer Bruno Boretti. In one of the most beautiful places in the world, the Chianti hills of Tuscany, an avenue of cypresses opens onto Villa Gaeta, a wonderful 18th century residence restored by Bruno Boretti, interior designer and passionate owner. Villa Gaeta's history stretches back over four hundred years. It was first built in the 1600s and since then ownership of the villa has passed from one family to another. Only the central rooms of the ground floor, where the kitchen and cellars of the Peri family of Montevarchi stood, are from the original building, as is attested by the stone crest placed on the door of the current cellars. 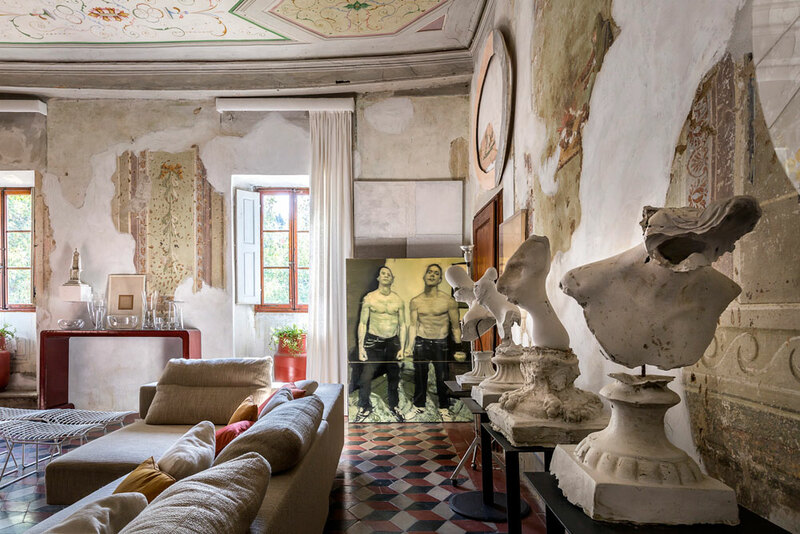 The frescoes are the true teller of Villa Gaeta’s history: in the century after the first construction, the building was enlarged by passing to the family of a judge, the Agnolesi. It is in this period that the Oratory of Santa Maria della Purità in Louis XVI style was added, while in the mid-19th century the villa was raised and the interiors were redecorated in the trend of the period, Victorian eclecticism. 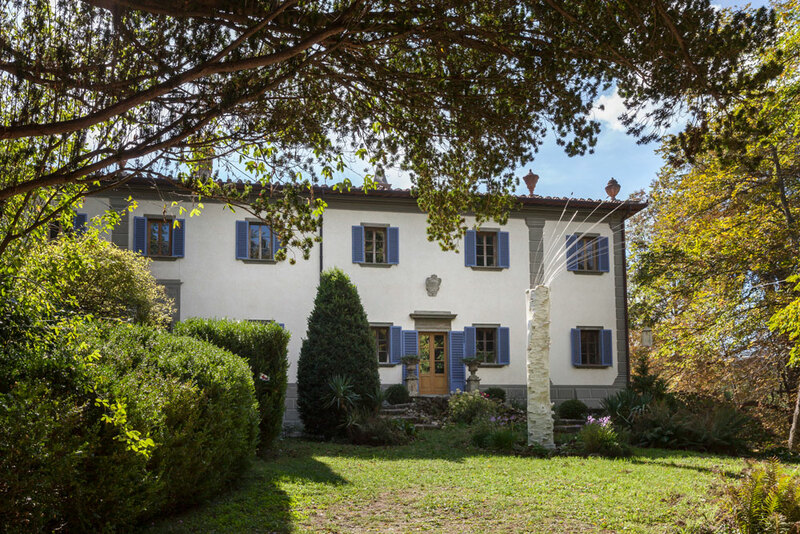 In those years, the property was owned by the lawyer Giuseppe Gaeta, the man who gave the villa an important component, which has survived until today: its wonderful park. Thanks to Gaeta, who was a botany enthusiast, the green space that surrounds the villa became a fertile ground for about 160 species of conifers, most of which are imported from North America, such as the sequoias and Douglas fir, and were planted for the first time in Italy right in the garden of the villa. This garden, cultivated with passion by Gaeta, is today called the Pinetum di Moncioni, a park of about seven acres on the ridge that divides the province of Arezzo from that of Siena. Thanks to the current owner, the designer Bruno Boretti, the park has become an open air sculpture garden of contemporary art. 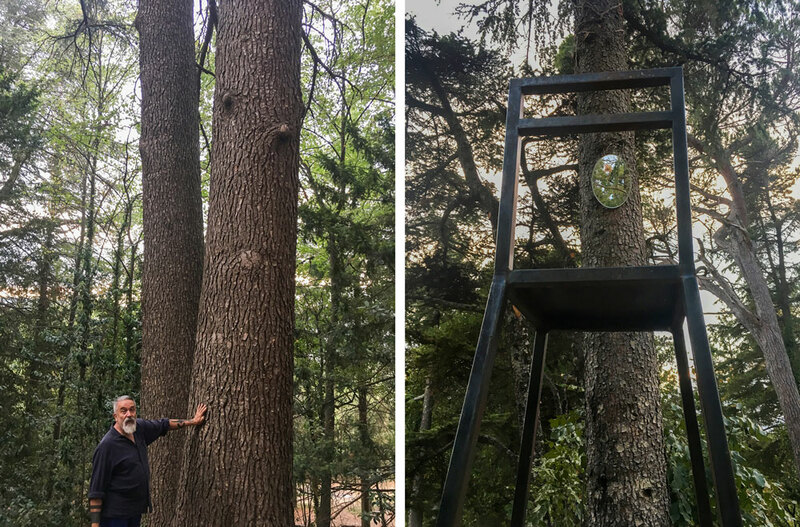 In fact, Pinetum is also the name given to the Biennale created by Boretti and dedicated to art and design. Each year, a group of young artists are selected to stay in the villa and make permanent works that enrich the alboretum, turning it into a real open-air museum. 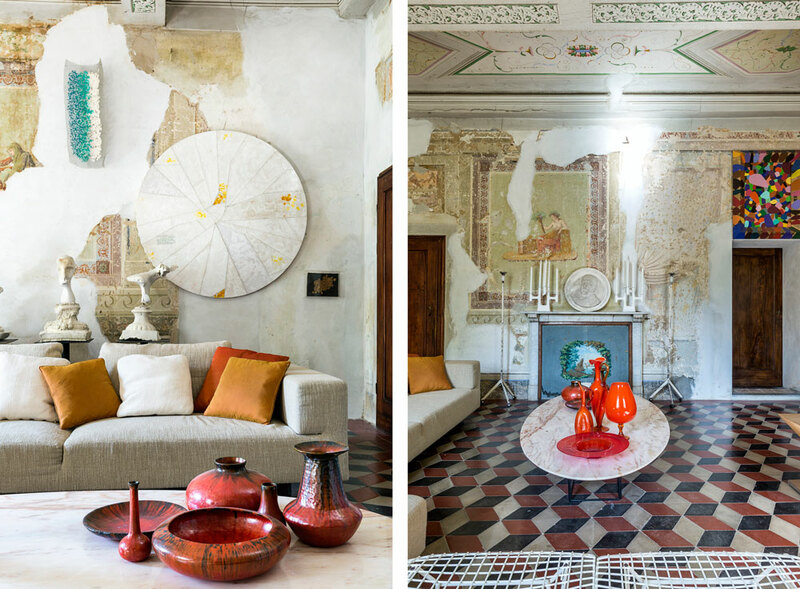 Barnebys spoke with Bruno Boretti, the villa's owner and renowned designer who oversaw its restoration, renovation and interior design, about what inspired him to purchase the villa, his favorite design pieces and what's next the Pinetum Biennale. Barnebys: Bruno, can you tell us about the first meeting with Villa Gaeta? Bruno: You could actually say that it was the house that chose me and not the other way around. Before I moved into Villa Gaeta I lived on a farm which I spent a lot of time renovating. But when I saw Villa Gaeta in a newspaper ad, I immediately realized that there was something special about the house that was different from other places I looked at. 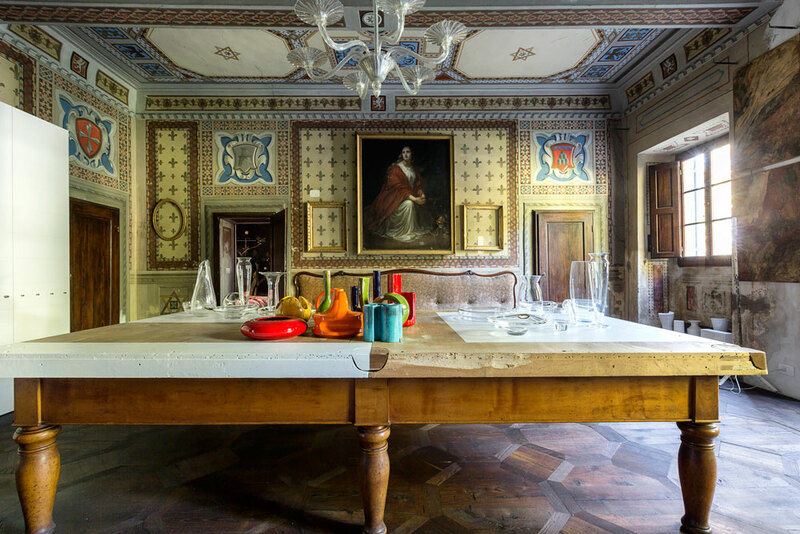 When I got there, the villa reminded me so much of my childhood and brought back the fragrances and the feelings I felt as a child when I would visit one of my childhood friends Maria Luisa, granddaughter of the Marchesa Guasconi della Robbia. At that moment I understood that this was the right place for me. For a while I actually thought about renaming the villa, as a tribute to Luisa. But then you kept 'Villa Gaeta' as the name? Yes I did. I am actually the first outsider, who is not related to the house's original family, to live here. The last owners before me were the Monaci family, with Marianna Gaeta as the head of the family. Marianna was a close relative of Giuseppe Gaeta, who built the garden. After she married a Monaci, the property was called Villa Monaci for almost a hundred years. When I bought the property I had plans to name it after Luisa, but instead decided to take back the name Gaeta. How would you define the style of the villa? My home reflects my own history as well as my career. From my first encounter with antiques as a child and during my time at college, I often looked for unique objects and rare designs. I like many different styles and eras! Objects from the 1930s, ‘50s and ‘70s: why should one have to choose among beautiful things? All different eras have contributed to the aesthetics I appreciate today. The villa's interior differs from all the other homes I have designed. Usually, I create modern interiors that are very much rooted in the present and more minimalist. My first interior design job to be published in a magazine was in 1982, and it was titled ‘Less is More’. 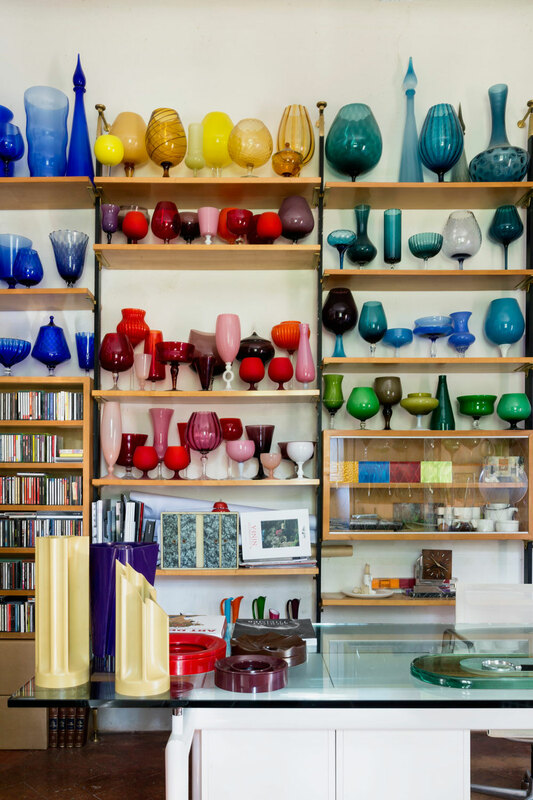 Can you tell us about your unique glass collection? I've always loved glass. 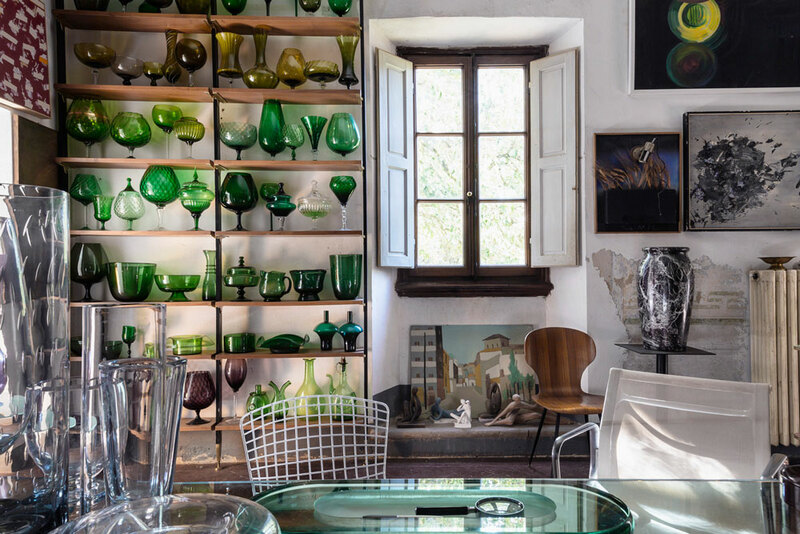 In the '70s and 80s I had a very nice collection of Murano glasses with more than 30 pieces. But after a while the collection overwhelmed me and then I started to use the pieces as a colorful feature in my design work. If I see something I like, I buy it for myself, use it for a while and then sell the item to someone else. For example, I sold the Murano collection and with the money, I bought a piece of land in Chianti with a vineyard! However, glass from the city of Empoli has always fascinated me because they remind me of the Tuscan kitchens of the '50s when everyone had a big Empoli glass with ears of wheat inside. I live near Empoli, so I look for pieces there often. 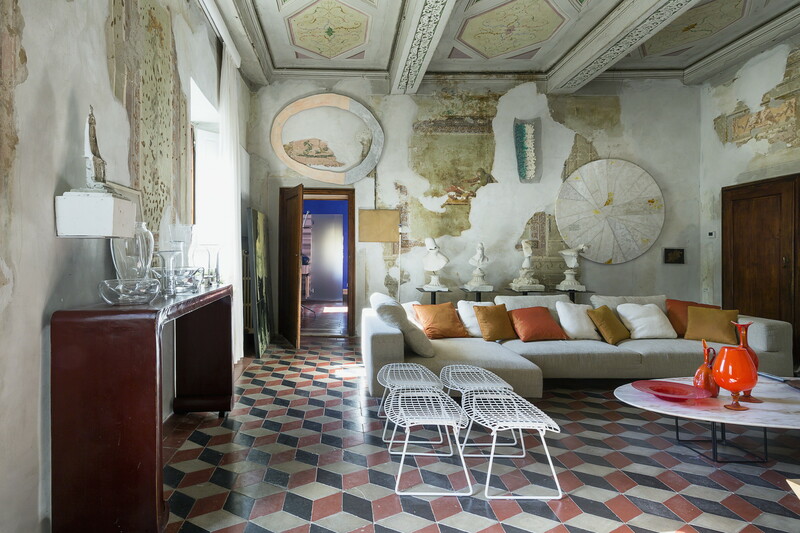 Last year I furnished a villa in Forte dei Marmi and I used fifty pieces from my own collection. The villa is rich in design and art. Where do you prefer to buy your pieces? I have always bought artwork and furniture on emotional impulse, often finding them at the markets, like at the antiques fair in Arezzo. I put great value on the discovery process and like to see something beautiful in things others discarded. People throw away so many beautiful things without knowing about their history. I recently bought a beautiful table by Carlo Scarpa in a flea market, probably left by some heirs who had no idea what they were getting rid of! The villa has very distinctive blue walls. How did you choose the color? The choice was actually not an easy one. During the renovation I found the original ceiling, but there was no paint on the walls, so I looked for a color similar to the blue of the ceiling. 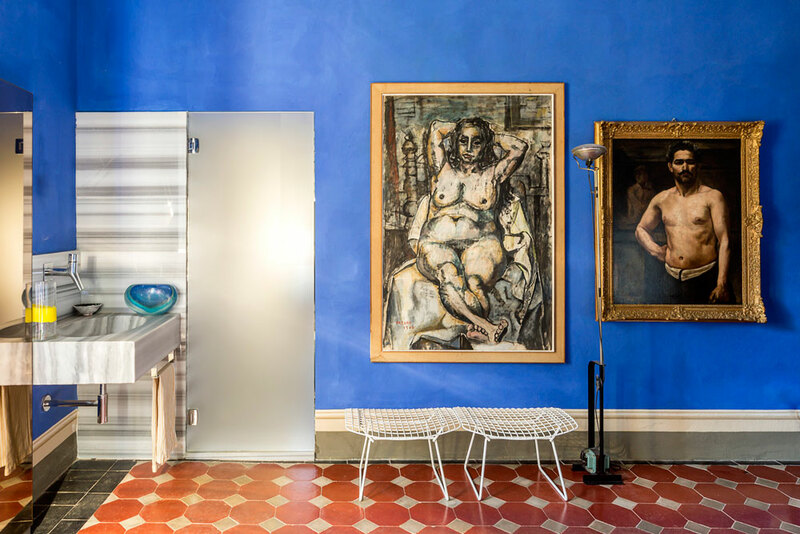 During the restoration of the Bardini Museum in Florence, they found a similar blue under the plaster. In fact the color is called Blu Bardini. A famous antique dealer copied it from the Russians in Saint Petersburg. Blue has always been a precious color, because it was made with lapis lazuli. In fact, the mantle of the Madonna in ancient paintings is often blue. The project began with extensive historical surveys. My first goal was to find out what was underneath the post-war rubble. We discovered a fresco of the Four Seasons in the living room, though only Autumn and Winter have remained because some walls were demolished during the 19th century. Once the frescoes were found, it was the house that guided me in the project, because at the beginning I had a completely different idea. I wanted to paint everything white! The villa's interiors are constantly changing. I will certainly add my own furniture creations, for now I have designed the dining table. What are the iconic pieces to which you are most fond of in the villa? The Enzo Mari vases I have on my desk. Mari was a great source of inspiration for me. His idea that shape should reflect function without compromising on aesthetics is a concept I take to heart. 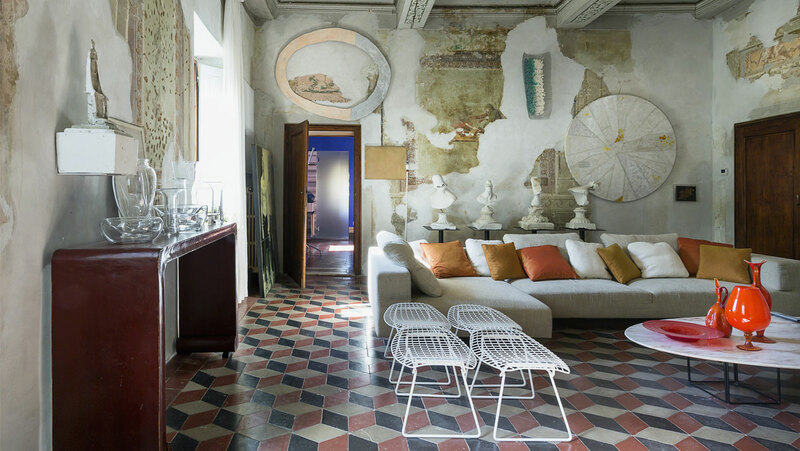 The villa is clearly full of contrasts, a carefully calculated mix of traditional antiques and modern, industrial design. The contrasts are beautiful; it’s the mix of overlapping eras that gives the villa its warmth. If everything was from the 18th century it would be like living in the past, and we are almost in 2020! I like change. To me, it feels wrong when I visit a house I decorated and find that it just looks like I left it several years ago. Do all the artworks in the house and in the garden come from the Pinetum project? Yes, many of them come from the Pinetum Biennale, which is now in its seventh edition. We often succeed in engaging important designers and artists. I like to go quietly in these projects but always strive for high quality. For example, the lights designed by Vittorio Venezia for the chapel will be presented at the exhibition the Salone del Mobile in Milan. The busts of the villa were created by Roberto Dragoni, who made them the first edition of the Pinetum biennial. They represent the villa's original owner. 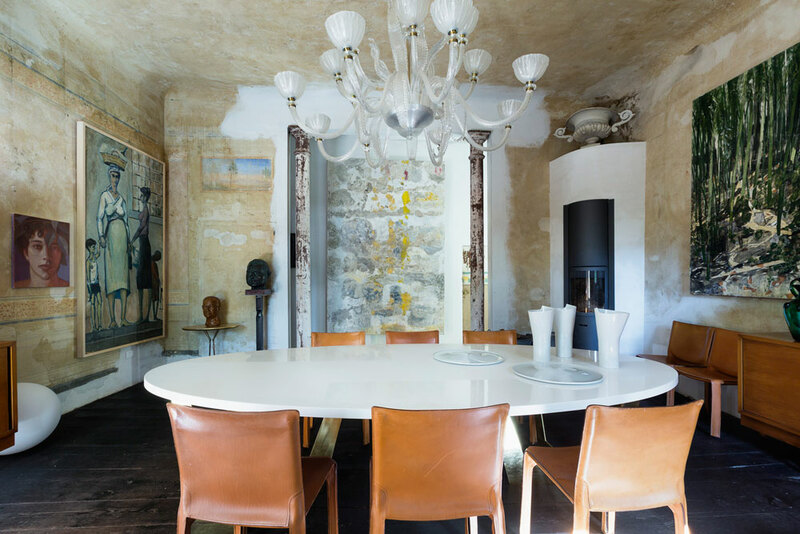 In addition to being a home, Villa Gaeta is a place for events and workshops. The beautiful villa is open to visitors, who can walk between the eclectic rooms and find both history and modern design. 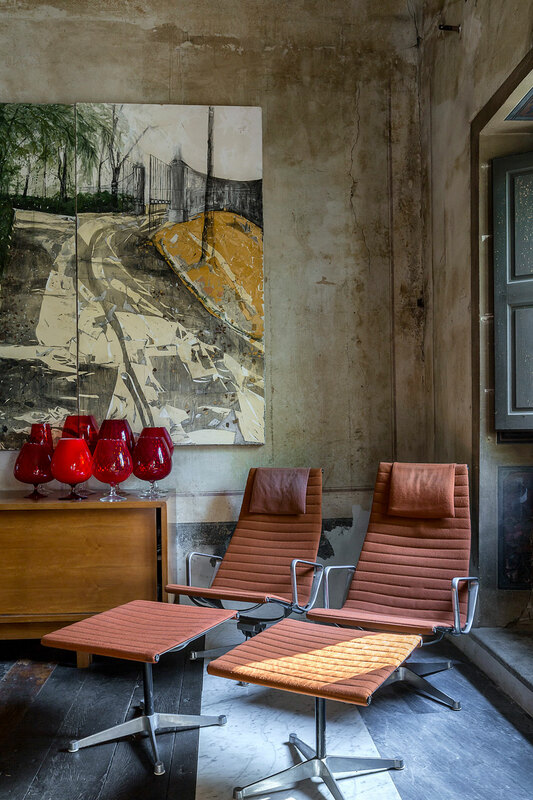 The rooms of the residence welcome guests, who can stay among the wonderful frescoes surrounded by Alboreto. The villa has three different residences: the library, the empire room, and 900 room with living room. All the photographs in the article are by Francesca Anichini.